Sumbu lies perched on the shores of gigantic Lake Tanganyika. 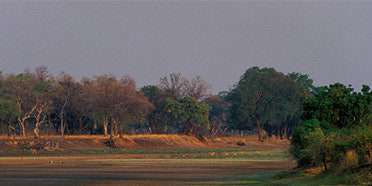 It is a long way off the popular Zambian safari circuit and few tourists, except diehard fishermen and crazy scuba divers make it all the way here. The park does boast good numbers of rare sitatunga, a handful of elephants and skittish cats. But, like many of Zambia’s lesser-known parks, bush-meat poachers and hungry locals seriously denuded it in the recent past. It remains an attractive reserve with high hills and stunning views onto the huge lake: a great place for walking and fishing safaris. However, I personally think one of its greatest attractions is that it’s the only place in Zambia where you can go scuba diving! If you feel brave enough to dodge the odd crocodile, then don a mask, fins and tank and slip into the warm, azure, crystal-clear waters and you’ll find yourself immersed in an unexpected world of colourful cichlid fishes … but I hasten to add that this is not for those who are faint of heart! Sumbu National Park hugs the shores of Lake Tanganyika, at Zambia’s northernmost tip, taking in cliffs, beaches and sheltered bays, as well as hills and valleys in the interior. It isn’t a great place for seeing big game – there are antelope, buffalo, zebra and occasionally lions and elephants here, but a visit could easily pass without seeing anything much, although puku and warthog sometimes visit the beaches. This is more of a place to relax in on the beach (there are two lodges here, one inside, and one just outside the park) or to indulge in a spot of angling. Sumbu is popular with fishermen, and Nile perch, tigerfish and lake salmon can all be caught here. Swimming is probably best avoided though, the lake is stuffed full of monstrous Nile crocodiles! Lying on the southwestern shore of Lake Tanganyika, Sumbu (or Nsumbu) is popular with would-be tigerfish-wrestlers. I’m not into angling and am not too keen on the lake’s other fearsome residents, crocodiles, but the park does have other attractions. Despite being well off the beaten track, Sumbu is reasonably well protected and funded, with recently improved access roads and a couple of lakeshore lodges. There’s a good population of herbivores here, including antelopes, buffalo and hippos, plus small herds of elephants. The combination of habitats also makes this a good place for birdwatching.